Say you are just chilling in a park on a Sunday afternoon with your dog, reading a book. Suddenly a fight breaks out between two people and a raucous crowd gathers. It gets noisy and you decide to take a look. Two youth are rolling on the ground and fighting like crazy. Suddenly someone from the crowd emerges and says he understands the reason they are fighting and says he will try to intervene. The crowd calms down at the assuring words of the mediator. But to your utter shock, instead of moving towards the guys wrangling on the ground he advances menacingly towards you. Grabs you by your neck and starts thrashing you. Next he tears up your book and vomits all over your beloved pet dog. Bizarre WTF story, isnt it ? But this is what has been happening to Hindus in recent times. Praveen Swami in a particularly despicable article in The Hindu takes wild swipes at the holiest of holy Hindu pilgrimages, the Maha Kumbh in the context of a dogfight between the Congress party and the angry Muslim clerics over the Rushdie affair. Here is a template many of us have been observing in the media of late. This cycle has got to stop. Now. Find something else. We wont issue Fatwas, but demonstrate to the world that these people are just clever but insecure imbeciles. Hamsters working ever harder trying to meet the insatiable demands of their masters. Praveen Swami after a flying recap of the Salman Rushdie affair, lands upon this. Few Indians understand the extent to which the state underwrites the practice of their faith. 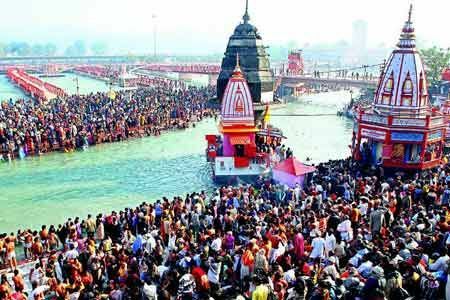 The case of the Maha Kumbh Mela, held every 12 years at Haridwar, Allahabad, Ujjain and Nashik, is a case in point. The 2001 Mela in Allahabad, activist John Dayal has noted in a stinging essay, involved state spending of over Rs.1.2 billion — 12,000 taps that supplied 50.4 million litres of drinking water; 450 kilometres of electric lines and 15,000 streetlights; 70,000 toilets; 7,100 sanitation workers, 11 post offices and 3,000 phone lines; 4,000 buses and trains. The FCRA has been used largely to scrutinise Christians priests and nuns, a few Muslim groups and secular NGOs who receive funding through official channels. Meanwhile, hawala dealers are able to evade FCRA checks with the same felicity that they avoid Home Ministry surveillance. Let rewind to these numbers , Rs.1.2 billion for 12,000, 50.4 million litres, 450 kilometres of lines and 15,000 streetlights; 70,000. Let me throw in toilets, fire services, ambulances. The Maha Kumbh is one of the largest human congregations on earth. Over 60 Million people participated in the event he is talking about in 2001. The crows of the event could be seen from space. The state is merely providing PUBLIC AMENITIES as its normal call of duty. The alternative would be to let millions including thousands of foreign tourists die in an outbreak of Cholera, riots, or leave behind a mountain of human waste. The most jarring part of his essay was this line, which prompted me to write this blog. That isn’t counting the rent that ought to have been paid on the 15,000 hectares of land used for the festival .. ..but it is instructive to note that an encephalitis epidemic that has claimed over 500 children’s lives this winter drew a Central aid of just Rs.0.28 billion. Lets see this from a property rights angle. What he is saying is the Hindus who participate in the Kumbh Mela event, which predates all known formats of the Indian state, have no title over the venues. Which are sand banks, ghats, streets, and nearby spaces. In such a school of thought, the participants have to pay a fee (a tax) to the state from the proceeds of which the state will “rent these ghats” and provide the aforementioned amenities. From time immemorial, Hindus have treated these lands as their own, not in the sense of ownership rights but being able to continue ancient traditions such as the Maha Kumbh, Chitirai Festival, and countless others. If you demand to see title papers (most Christian and Muslim properties DO have proper title papers) then Hindus will have no choice but to create them. Territory, and traditions CONSTITUTE the Indian State. They came with the box. Obviously, this isnt the only weakness in this piece. The state has Hindu temples under its control, so his sudden puppy love for property rights is dead on arrival. Next, even from an economic viewpoint, the Maha Kumbh is a grand tourist spectacle with millions of people from all over the world arriving and staying for weeks. The govt will stand to gain by spending on amenities and reaping benefits of orderly tourist activity compared to being burdened with the costs of chaos and disease if it were to listen to Praveen Swami. Is Theism the danger to secularism ? Eight years ago, scholar Meera Nanda argued that “India is a country that most needs a decline in the scope of religion in civil society for it to turn its constitutional promise of secular democracy into a reality.” “But,” she pointed out, “India is a country least hospitable to such a decline”. Dr. Nanda ably demonstrated the real costs of India’s failure to secularise: among them, the perpetuation of caste and gender inequities, the stunting of reason and critical facilities needed for economic and social progress; the corrosive growth of religious nationalism. Eight years ago, scholar Meera Nanda was wrong, as she is today. Secularism does not depend on decline of scope of religion in everyday life. If that were the case, then abolition of religion would be its central task. Hindu, Muslim, or Christian individuals derive strength, confidence, pride, tide over depression, anxiety, using their respective faiths. There is nothing in it that puts it at odds with secularism. Religious nationalism is nothing but nationalism that calls upon traditional strengths native to the land. You call it Hindu nationalism, but it has never asked for privileged treatment of Hindus. What does not work is the state offering concrete benefits to groups based solely on adhoc communal considerations. This and only this will kill our secular state. So I read an article today called “Playing quoits with quotas” by Sushant K Singh, fellow of National Security at Takshashila Foundation and Editor of Pragati. It was written in response to the single issue in the UP polls. The tone of the piece seems to suggest that the quota offer by the Congress and subsequent re-alignment of its opponents are par for the course. Here is the harsh truth : If you cant control the states power to confer benefits to groups at its pleasure, you cant have any of the other goodies like a capitalist ecomony. Economic freedom is not a workaround, it is not even desirable because you wont have the political checks against cronyism. Consider the Congress’ promise of a Muslim sub quota ? What are the issues involved ? UPA government’s announcement, put on hold by the Election Commission, does not cover all Muslims or Christians. It carves out a sub-quota of 4.5 per cent for minority groups already included in the list of OBCs, from within the existing 27 per cent reservation for OBCs in government employment. The unreserved component of jobs thus remains unaffected. Should it not matter how the reserved components arrange themselves ? Is it okay if just a few groups within the 50% duke it out ? I am going to show you how easy it is to overlook the adhocism that lies at the root of this. Based on some study, it was determined they they are not adequately represented in the 27% quota. So it was decided to allocate a sub quota of 4.5 % to all muslim castes to ensure a near proportional representation for this group. a ) Why should only Muslim castes be analyzed for representation ? What if there are Hindu castes who are also being clobbered by the dominant OBCs ? What if they dont have the numbers to matter at the poll ? b) Why should the new group be along religious lines ? Why not a MBC or EBC model here ? d) If Muslims have indeed been grossly underrepresented after 20 yrs of quota, that is a damning indictment of the ‘lets not scrutinize this’ policy of the court. So, how do we find out other groups that arent represented ? Dont worry if you dont have the answers. No one does. The whole thing is adhoc with benefits purely at the pleasure of the politician. If each community receiving benefits (including Muslims) were in a scrutiny regime, issues of under representation would never arise. Lack of representation would feedback into the system. There is no role for politicians because data drives the car. In the UP elections, Congress are offering the Muslims a special social justice deal that others are being denied. We looked at adhocism, next the growing powerlessness of the free agent to direct things. To contain the divisive politics around job quotas, the next best alternative then is to make government jobs both unattractive and irrelevant. Evidence from southern and western India shows that economic growth and rise of private sector is the best way to reduce the relevance of government jobs. These growth models can be replicated across the country only by initiating the second generation of economic reforms.To inverse the cliche, it will be a case of good economics leading to good politics. This paragraph pretends like quotas only apply to government jobs. In reality, it pervades everything from education, scholarships, loans, panchayat elections, petrol pumps, even Lok Pal. But lets stick to jobs because it doesnt diminish my point. The quota system determines which set of humans sit in parliament and legislatures. This group and only this group represent the Indian state. It would be naive to expect them to desert the interest groups who voted them in and focus on policies that undermine the very system that got them in. The benefit regime is not about government jobs (or any of the other benefits such as petrol pumps or gas agencies,which were announced between the time I began the draft of this post and now!). It is about who gets to sit in parliament and the concentration of big interests in the Indian state. Thats a good question. This hits at the very core of the contemporary Indian state. The state (which is nothing but a bunch of humans) will encroach as much on your fundamental rights as the judiciary allows it to. That is their nature. The judiciary is shirking its constitutional duty to scrutinize the benefit regime even thought it impinges on rights of equality and social justice. Why else do we have another pillar of democracy ? Wondering why none of these are on the voting block in UP: Sky high prices, all around filth, no power, pollution and sickening drone of diesel gensets, corruption, or complete lack of infrastructure. Read on. It appears, they have recently come into possession of data. We are very much reaching out to a number of castes within the dalit group to build our base. A number of social activists have been working with us. We have statistics to tell the people that only a particular caste in UP has got benefits, which include representation in the state council of ministers and also in government recruitments,” said a senior Youth Congress functionary. What statistics ? How did you get hold of this ? Why isnt this public and actively feeding back into social justice ? A “senior Congress leader” tells us that this secret data shows that only one group is benefiting from quota. If this is true, the Indian state led by the Judiciary has committed an unpardonable crime by cheating tens of millions their share of social justice by giving a wink-wink to scrutiny. This is injustice by design. It isnt too late, such disaggregated data must lead social justice programs. Delivery must be automatic so politicians can step aside and let people vote on bigger issues. Our democracy will never rise beyond “low grade” will sink lower until it suffocates itself from its own anomalies.